> We are delighted to invite you as Judge for the event. Your presence will be an honor for us and source of encouragement and motivation for students. Looking forward to welcome you at our campus. Those are the exact words from a letter I receieved on Feb 1st, 2019. It was sent by **Jinnah University for Women**, which is the first Women University of Pakistan founded with the aim of educating women and hence the nation. Advising and guiding these girls for their this simple yet amazing project, I got to learn many new interesting things about Jinnah University for Women. So I wanted to visit this university at least once and check the awesome work of the students on latest technologies. 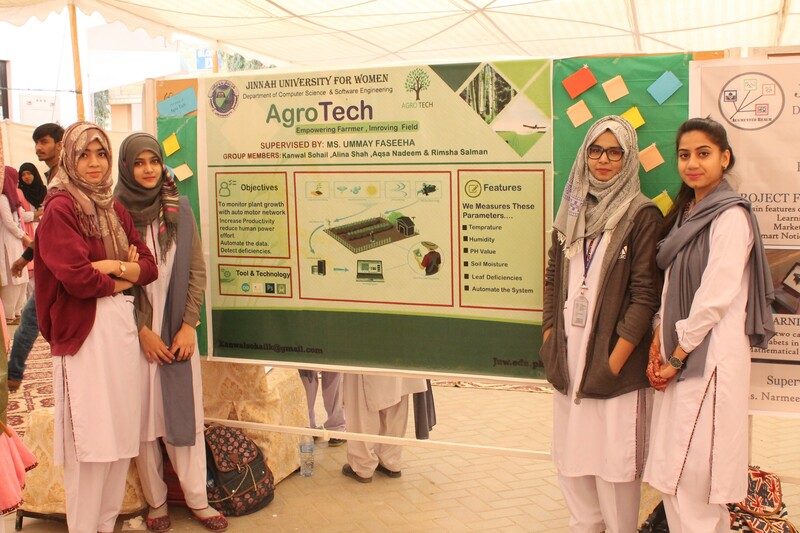 When Aaisha told me that there’s going to be an exhibition called as JTech 2019 in their university, where all the final year projects (FYPs) of students will be displayed, I was more than thrilled to attend it. She asked university and event administration to invite me. Thank you Aaisha and team for vouching. To my surprise, the university sent me a letter to invite me not as a visitor or external advisor rather as a judge to evaluate these awesome projects of their students. 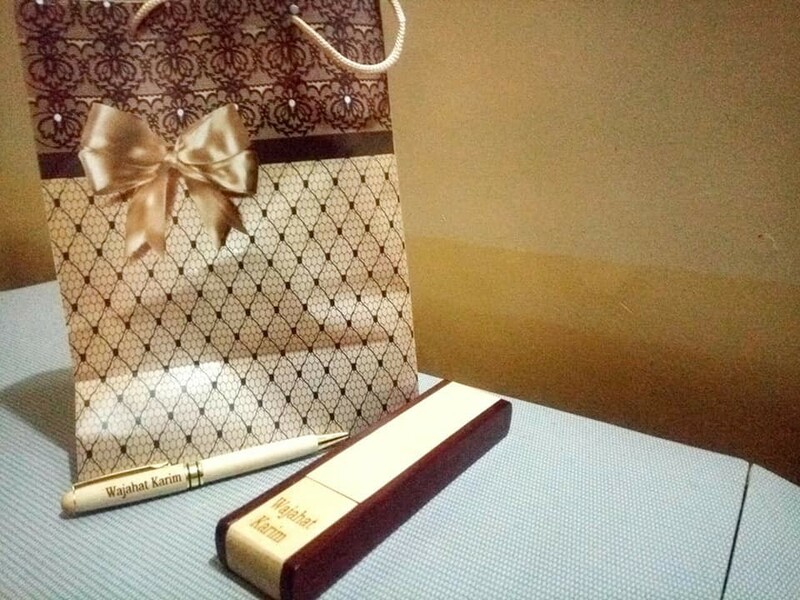 I felt so much honored and happy and accepted the invitation in an instant. 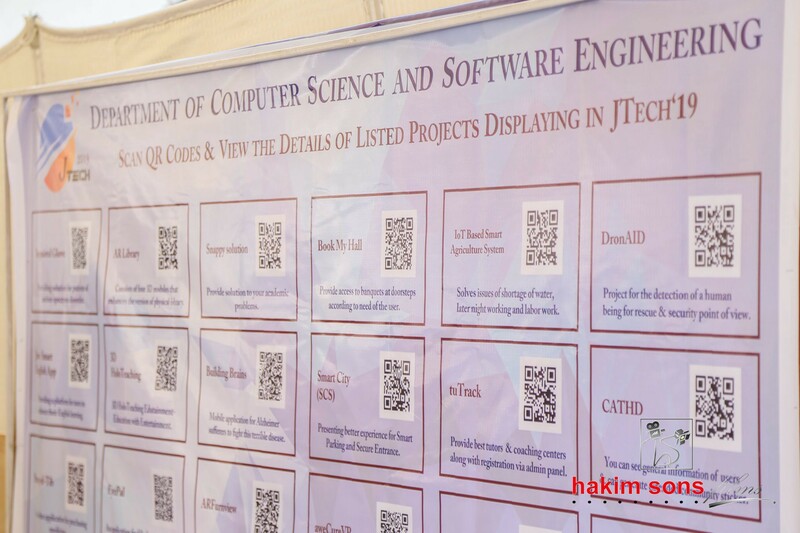 Every year at JUW, the department of CS and SE organizes an exhibition of the final year projects. This year the exhibition was JTECH 19. It was held on Thursday February 7, 2019 at Jinnah Unviersity for Women Nazimabad, Karachi campus. 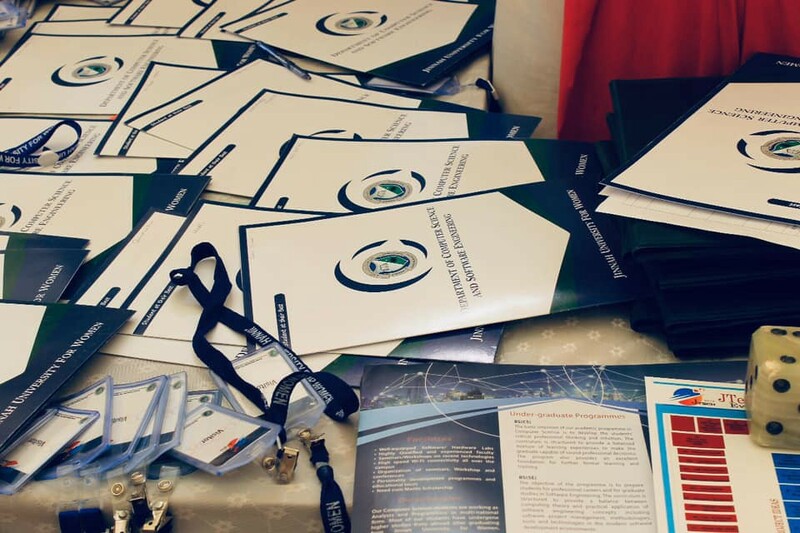 The event included exhibition of software and hardware projects, Job Fair and Idea to Product competition. I arrived at the event around after 11:00 AM. I was welcomed very gracefully by the organizers (specifically *Kanwal Zahoor). *She showed me around a little. It was very nicely decorated and a little crowded with students and visitors. I liked the ambience and the environment a lot. It reminded me of my old university days. The hall was big enough to accomodate around 30–40 stalls. Majority of those stalls were occupied by students exhibiting their final year projects. Some stalls were exhibiting project proposals in forms of large size posters. (Idea to Business). And rest of the stalls were occupied with companies for the job fair and were busy in interviewing candidates for their available vacancies. There were lots of talented students with amazing projects. Honestly, I attended some exhibitions (of some expo events and big universities in the past) but the quality of the projects at JTech was whole another level. 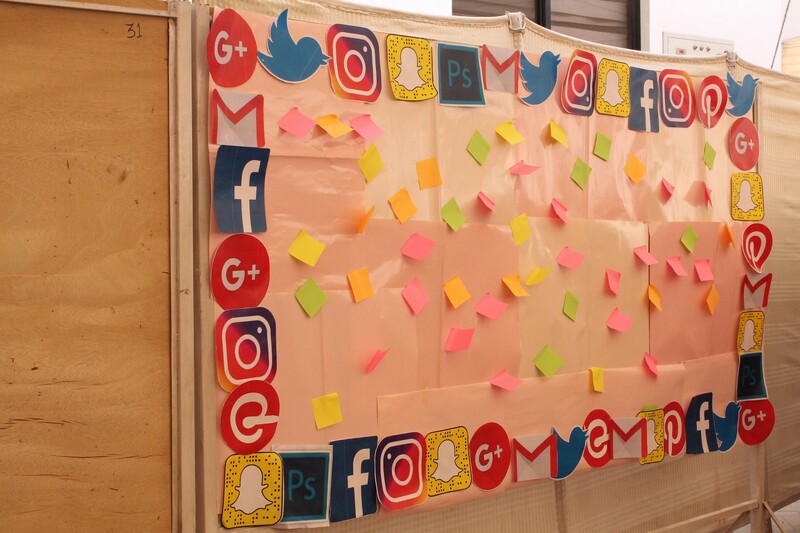 The students had used technologies such as Google Firebase, Android, Blockchain, Robotics, Artificial Intelligence, Augmented Reality, Computer Vision, Virtual Reality and Internet of Things etc. I was amazed to see the quality and stage of the projects. Even the posters and proposals were quite amazing focusing on the real problems in areas such as agriculture, disabled people, facial recognition, security & privacy etc. I was given a list consisting of 5 projects and 2 posters to evaluate. The questionnaire included questions like level of the idea, the compeletion stage, is the project viable as business, should the project go into any startup incubator, and the innovation in the project. It took me about 2 hours to evaluate, in which I tried to understand the ideas, their implementation, what technologies they have used, what was the inspiration behind their ideas, and the future plans. Once I was finished. I made a round to visit all the remaining projects including one which I was the external advisor for. Overall, it was quite an experience and I learned a lots of new things. The students’ presentations were very good in quality and they were prepared. Some projects even had won competitions and their prize shield were also staged on their stalls as achievements. I was very impressed honestly. All of the projects at the event were really good but some really impressed me. I was under impression that these are the final year projects of upcoming graduates, so I hadn’t any higher expections. But I was amazed to see a whole new level of the work. Smartable is basically automated system for Restaurant. The purpose of bringing this concept is to eliminate the manipulation of paper documents. Reform working with digital technologies. Users can store information on their system and at the same time save money. No more printing and storing paper documents. Our aim is to focusing better user experience, and providing them convenience. Majority of people have the problem like to forget eating medicines on time. 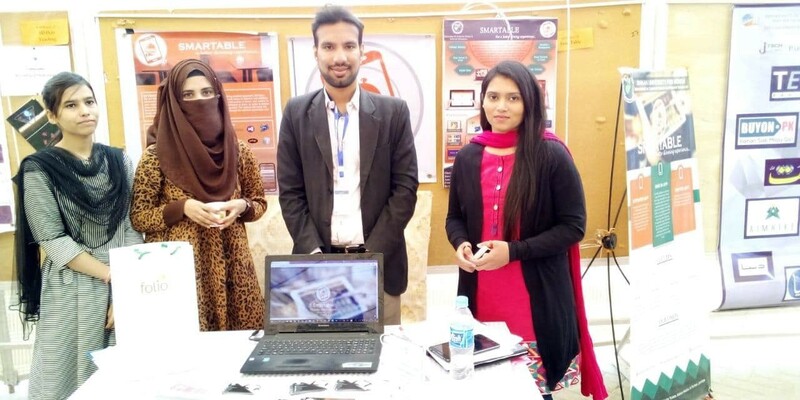 Keeping this in mind, these girls have developed the project Souq-ul-tib. With this application, people can get the facility of getting medicines at their home, can set the timing of taken medicines and can also get the information of drugs. Achieving independence may now be more accessible for people with autism spectrum. Technologies have entered the marketplace which can support self-monitoring and reduce need for assistance. Autism Cure is the project developed by JUW students, that is provided within Urdu for the age group of 5–8 years. Currently, the most common uses for drones in humanitarian response are mapping and monitoring, delivering supplies and medicines. 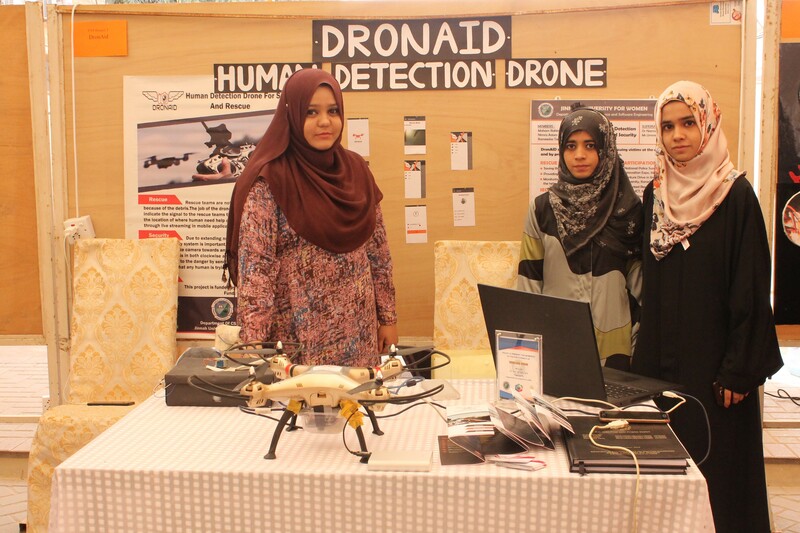 This lead JUW students to wonderful idea of DronAID that is human detecting drone that works in the risky or insecure situations. The mobile application notifies concerned authorities through live video streaming and alerts. Alzheimer’s is a chronic neuro-degenerative disease that is major cause of dementia. In Pakistan, many of public and private medical agencies are working over it. 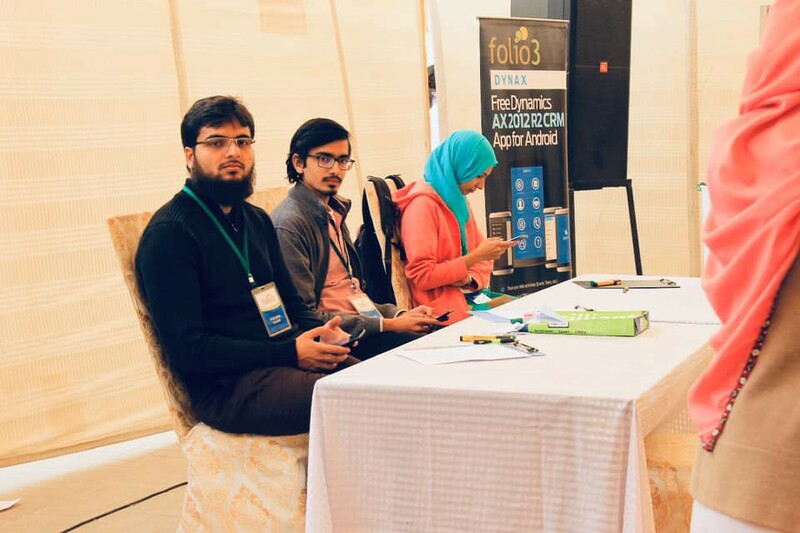 Students of Jinnah University for Women have developed some helpful tools for the patients suffering from Alzheimer’s disease. After this amazing experience at JTech, I was asked to give a video interview and share my feedback with the university. Also, I was offered this beautiful shield from them. 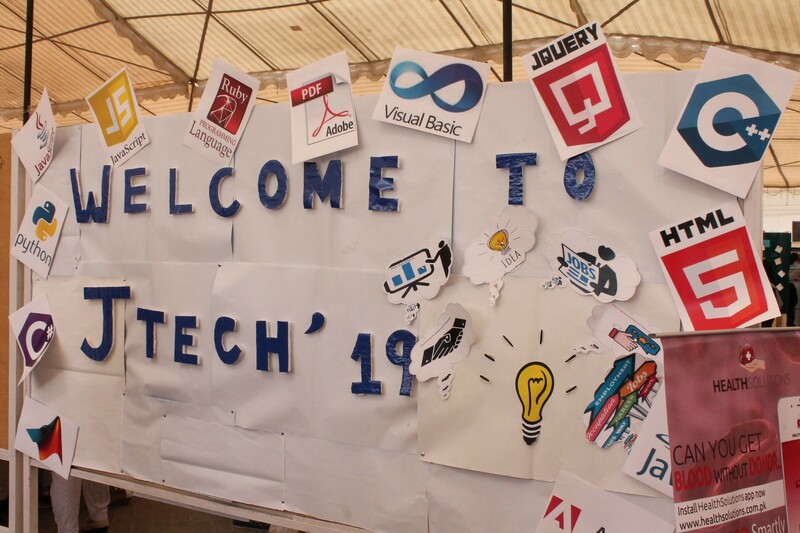 Thank you JTech 2019 team, Jinnah University for Women faculty, staff, and their awesome students for the honor, hospitality, and the respect.